Quality service and affordable prices! 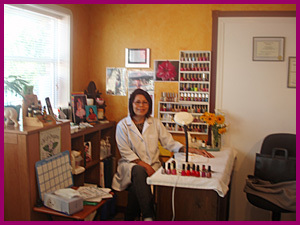 Victoria McLeod is certified in aesthetics and specializes in pedicure and massage. If you have fungus toenails she can help cure your problem nails even if your diabetic. Victoria's Aesthetics & Foot Care offers relaxation massage techniques and body treatments. Invite your mom, daughter, friends, or pamper yourself. Bring some goodies and give us a call to make an appointment. Services are available for all ages, including men, women, and children. If you would like French Polish, please add $10. GST additional. Payment methods are only accepted in the form of cash or cheques.